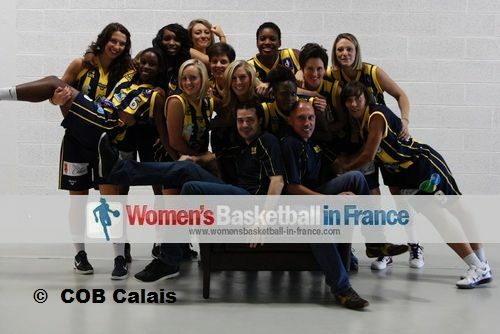 Last season (2011-2012) COB Calais were not sure of accepting promotion even if they had won the LF2 basketball championship trophy. They achieved their major objective of qualifying for the end of season final 4 and taking the bronze medal was just a bonus although taking the title would have been the icing on top of the cake. Veuillez lire des informations en français sur l'effectif 2012-13 de COB Calais en bas du page. Cyril Sicsic has gone and his assistant Kévin Brohan is now the head coach. The relegation from the LFB in 2010 did Calais more good than bad because they had been able to find new sponsors and clear most of their outstanding debts. However the club is still not sure if they are able to take their place in the LFB in case they win promotion. Yet with just two players leaving and the core of the roster still in place Calais are serious candidates for the title. Émilie Duvivier and Cherin "Britany" Miller are the two players that left and they have been replaced by Jenny Fouasseau and Kierra Millard. Fouasseau's transfer ends a 16-year stay with Reims, while Millard is coming from the Lady Riders (Texas Tech) in the NCAA. Mélanie Arnaud, Aurélie Cibert, Mélanie Devaux, Mélissa Diawakana, Floriane Herrscher and Manon Sinico were all under contract last season and decided to extend their stay for the coming season. 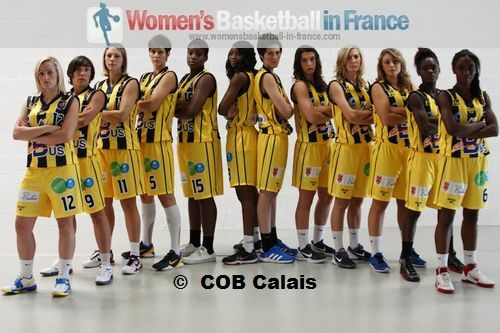 All the remaining players on the roster are from the COB Calais academy: Marine Capon and Constance Delbecque already played last season while Penda Ly and Natacha Ahamada are new to the first team. Calais have no reason not to be in the top four at the end of the regular season as they appear to have the strongest back court of all the teams in this division. A quelle vitesse va Kévin Brohan ? Assistant de Cyril Siscic l'année précédente, Kévin Brohan a tout ce qu'il lui faut pour gagner le titre en LF2 : 6 joueuses de la saison dernière, quelques joueuses du centre de formation de Calais dont deux ont déjà joué en équipe 1 et deux recrues Jenny Fouasseau de Reims et Kierra Millard du NCAA, États-Unis. La stabilité de l'équipe, l'expérience de Cibert, Herrscher, Sinico et Arnaud et l'attitude positive de l'entraineur devraient porter leur fruit pour une nouvelle arrivé au final four fin de cette saison et une éventuelle montée en LFB.